A group of aliens come to Earth to capture the Looney Tunes for their amusement park. The Looney Tunes convince the aliens to give them a chance by playing a deciding game of basketball. However, the aliens go and steal the talents of several top NBA players and transform into the giant Monstars. The Looney Tunes try to persuade a retired Michael Jordan to join their side. Hoping to rekindle some of delight that Who Framed Roger Rabbit? (1988) was greeted with when it came out, Space Jam brings Warner Brothers’ Looney Tunes out of mothballs (they having not appeared in anything bar the occasional tv special since the early 1960s) for a similar live-action/animation mingling. 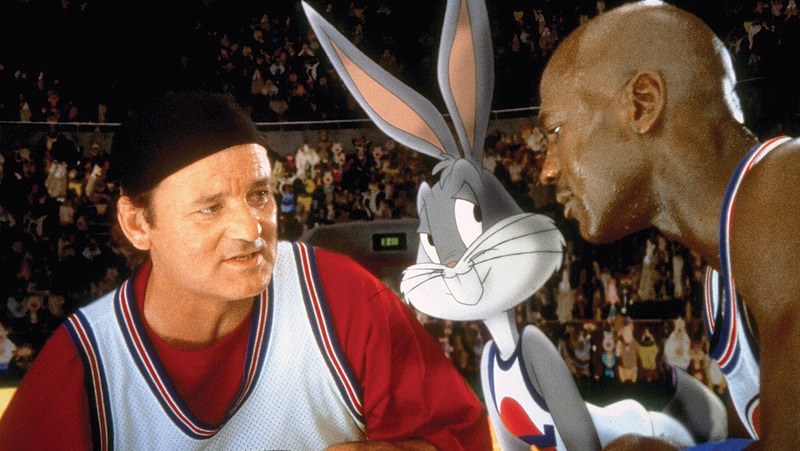 That Space Jam is also a feature-length expansion of a Pepsi commercial that paired Bugs Bunny and NBA star Michael Jordan may well say something about the spirit of the enterprise – there seems something completely sad about the idea of a feature film being derived from a commercial. Nevertheless, it is good to see the Looney Tunes back in action again. With the vast leaps in computer and 3-D animation over the last few years, they are brought to life and integrated with the live action with far greater depth and roundedness than they ever had in the original shorts. For all that, Space Jam is a disappointment. The central basketball game itself is lively enough but something that soon fades in memory. The film itself lacks either the energy or the visual invention that the Chuck Jones originals had. For visual humour, it substitutes one-liners and lame pop culture in-jokes – like having the Looney Tunes parody Pulp Fiction (1994). The plot is thin on the ground – the reasons for having the basketball game in the first place seem contrived. Notedly, the story has to twist some of the Looney Tunes characters out of shape in order to set up its simplistic Toons vs the bad guys characterisations – traditional nemeses like Tweety and Sylvester or Road Runner and the Coyote are now seen on the same side. Michael Jordan is not much of an actor – although he certainly fares better than NBA stable-mate Shaquille O’Neal in Kazaam (1996), which came out around the same time as Space Jam – and it is becomes obvious that he is reacting to things that are not there in front of him during filming. Looney Tunes: Back in Action (2003), which originally began as a sequel to Space Jam, is a much better revival of the Looney Tunes characters.